Happy Birthday Jeannie C. Riley whose go-go boots launched a revolution in country music! Blog post by Portland's classic country DJ Action Slacks. "The Girl Most Likely"
Jeannie C. Riley - "The Girl Most Likely" to break the country music mold! Jeannie C Riley was a late 1960s phenomenon whose early career was molded by music industry genius Shelby Singleton. TODAY she turns 69. Eventually I will write that essay on the musical experiments of Shelby Singleton that I've always wanted to write, but for now lets concentrate on one of the artists he launched into stardom. A couple of years after the height of the go-go fashion craze, mini skirts & go-go boots made their way into country music by way of a little song called "Harper Valley PTA" written by country legend Tom T. Hall. The song was in line with the story-song style of Bobbi Gentry who had a smash hit with "Ode to Billie Joe" the year before. For the next few years Jeannie C. Riley would become a product packaged by that song. Her look and her follow-up recordings all played on the success of HV-PTA, a song that just would not die. There were a bazillion covers of the song from country to pop to jazz to soul to funk. People put out their own concept albums based on Harper Valley PTA, and still more people released singles riffing on the Harper Valley theme. There was even a movie/tv show in the lates 70s based on the song starring Barbara Eden (of I Dream of Jeannie fame). I suppose It made perfect sense since the song was kind of a take off on Peyton Place, which was a book and then a movie and then a tv show. People just couldn't get enough of Harper Valley. I guess a song about American small town hypocrisy really struck a chord in this country. Maybe it was a hint of the growing discontentedness of housewives tired of being confined by societal expectations. There was a women's movement bubbling up from the underground and things were about to erupt. But it was still 1968 and even though Jeannie C. Riley had recorded a song that plugged into the desire for women's liberation, she was still being controlled by the music industry. It's a shame that she wasn't allowed to grow outside of the Harper Valley box. 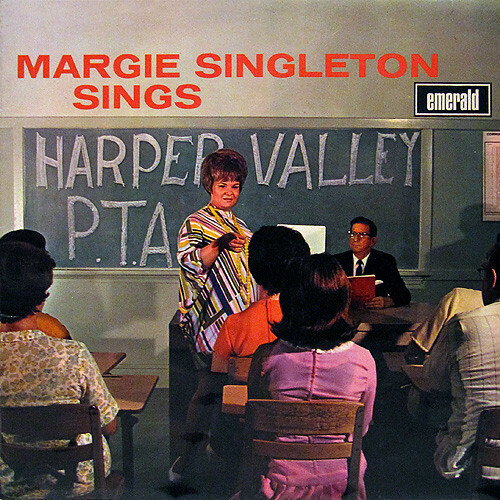 In a way, it became a bit of a Harper Valley prison, ironic since so many of the songs on the Harper Valley PTA album were about wanting to break away from Harper Valley. Still, a lot of good came from her success. It strengthened the tradition of feminist country music and certainly must have inspired other country women to strive for more mainstream success. And the music was not too shabby either! It was twangier version of the funky country-pop popularized by Bobbi Gentry the year before, a musical style trend in country that this DJ really loves! The record of the day is the follow-up single to "Harper Valley PTA". It's another song with a strong feminist message and a comment on classism and societal hypocrisy, especially when it comes to judging women. On top of that, this song really rocks. By that I mean, it feels really punk to me. Maybe it's because I first took notice of it by viewing this really raw KILLER live version. The 45 is also great even though it's a lot less raw. Check it out! Great article, Action! Way to go with this blog, it's super cool. I'm excited to highlight some of my favorite records in a variety of genres (soul, R&B, classic country, rockabilly, oldies, garage rock, etc). These won't all necessarily be "dance" records per se. They will all be records that I believe deserve a special listen. I simply love good music, rare or not. Hopefully you will spend some time here and love music right along with me! Lets give this a shot!